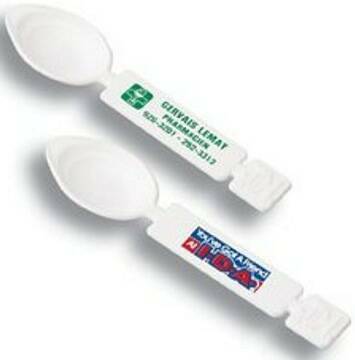 Custom Medicine Spoons Personalized in Bulk or Blank. 1 tsp and1/2 tsp. Promotional, Low Cost. Bulk discount plastic medicine spoons for quantities of 1 tsp and 1/2 tsp. Measurements molded into spoon. Conversions on underside of handle. The pharmacy symbol is embossed into plastic. Budget Prices in USA and Canada for bulk personalized medicine spoons . American clients pay no taxes. Production time:10 days after art approval; please call for faster delivery. Blank medicine spoons ship next day. Production time: 10 days after art approval; please call for faster delivery. Blank medicine spoons ship next day. Measures 1/2 tsp = 2 1/2 cc and 1 tsp = 5 cc. Size: 5 1/2" x 1 3/8"